Prefatory and explanatory—The voyage out—The sentimental—The actual—The oblivious—The medley—Practical joking—An unwelcome companion—American patriotism—The first view—The departure. As a general dislike of prefaces is unmistakeably evidenced by their uncut leaves, and as unknown readers could scarcely be induced to read a book by the most cogent representations of an unknown author, and as apologies for "rushing into print" are too trite and insincere to have any effect, I will merely prefix a few explanatory remarks to my first chapter. Circumstances which it is unnecessary to dwell upon led me across the Atlantic with some relatives; and on my return, I was requested by numerous friends to give an account of my travels. As this volume has been written with a view to their gratification, there is far more of personal narrative than is likely to interest the general reader. With respect to the people of the United States, I have given those impressions which as a traveller I formed; if they are more favourable than those of some of my predecessors, the difference may arise from my having taken out many excellent introductions, which afforded me greater facilities of seeing the best society in the States than are usually possessed by those who travel merely to see the country. Where I have offered any opinions upon the effect produced by the institutions of America, or upon any great national question, I have done so with extreme diffidence, giving impressions rather than conclusions, feeling the great injustice of drawing general inferences from partial premises, as well as the impossibility of rightly estimating cause and effect during a brief residence in the United States. I have endeavoured to give a faithful picture of what I saw and heard, avoiding the beaten track as much as possible, and dwelling principally on those things in which I knew that my friends were most interested. 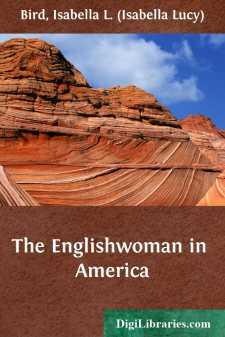 Previously to visiting the United States, I had read most of the American travels which had been published; yet from experience I can say that even those who read most on the Americans know little of them, from the disposition which leads travellers to seize and dwell upon the ludicrous points which continually present themselves.